The electronic control unit can be attached directly on to the pipe. This can be done either horizontally, vertically and even upside down. It may also be mounted on the wall or beam if there is not enough room. The only thing that is required is the two impulse cables to be wrapped on the pipe tight and neatly (like picture below). Note: electrical impulses can be wrapped vertical as well. Place Calmat on the pipe. 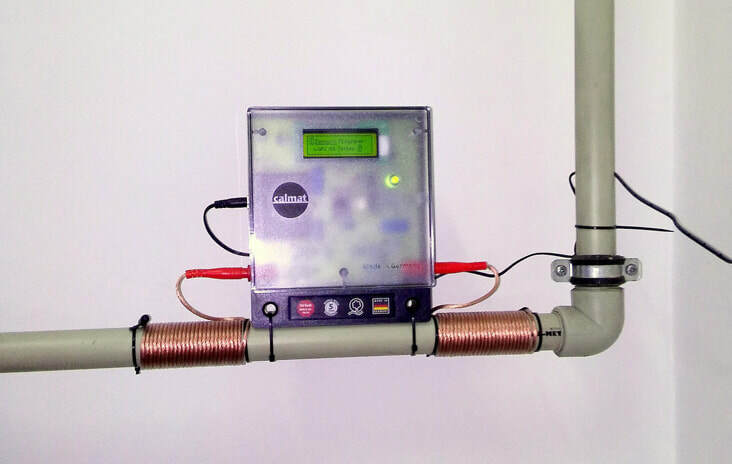 Install Calmat on the main water pipe and fix the electronic unit with the cable ties. Now place the red impulse cable in the left socket . Feed the cable to the back of the pipe and fasten with a cable tie. Wind the cable tightly and firmly around the pipe to create a coil. Plug the second impulse tie through the black loop at the end of the cable and fasten it. Repeat the installation with the second impulse cable again (see 2.). First connect the adapter with the electronic unit with the socket on the left site of the device. Plug the mains plug into the power socket (permissible voltage: 87 - 260 V, 50/60 Hz). The green control light will light up. The display will show "calmat". Please choose your language with the upper button (>). Then press the button (P) to select the program according to your pipe material and pipe diameter (a,b,c, or d). You can change the program selection at any time later.